12 years has passed since the shop RE Amemiya ; which is considered the God of rotary engines has first entered the Super GT race. Going into the final race of the 2006 season in 2nd place, there was a difference of 10 points from the leading team. One mistake, and they would be stripped away of their hard earned rank. A 5 point difference existed for the driver's title as well, making this last race a nerve-racking experience for team RE Amemiya. Going into the race with the usual drama that exists, the team manages to sweep two titles! Taking the team and the driver title as a double victory, it was the best way possible to end the 2006 season. 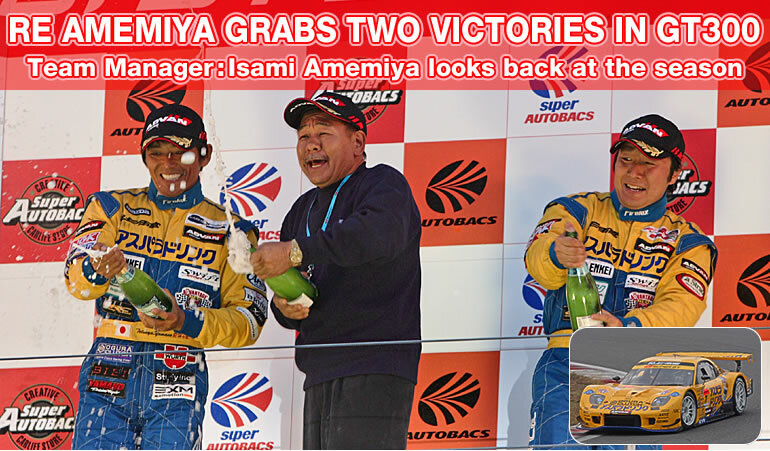 Mr. Amemiya proudly speaks of his 12 year involvement in the Super GT and what he has in store for us in the future. To view the movie, a Windows Media Player may be necessary. Please download it here.